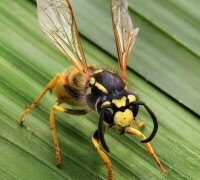 Most people who live around wasps know that they are not the friendliest neighbors to have and should be control by professional wasp removal service. Unlike bees, they do not offer any real benefits to you and for some reason; their stingers tend to hurt more than those of a bee. Should you be unfortunate and get stung by a wasp, proper first aid is key to make sure that the symptoms of the sting which include the pain and swelling are properly addressed. If this is done right, you might not even have to pay that costly trip to the hospital. Your first step should be removing the sting. Even though relatively small, it is visible to the human eye and its removal ensures that the toxins it contains stop finding their way into the blood stream and causing more damage. To do this, you can use your finger nail to scrape the affected area until the sting comes out, or you can use a pair of tweezers. However, you should make sure that you not pinch the sting as this would cause it to inject more of the venom into your system. One of the side effects of having been stung by a wasp is an almost definite swelling that can get quite hideous. To keep the swelling in control, ice the area after the sting has been removed as this will help reduce inflammation. If you have been stung on the leg or arm, it would also be of great help for you to alleviate it as this reduces the amount of blood gushing to the affected area hence reducing the swelling. It also helps to remove any jewelry that is tight. This is because, as the area that has been affected swells, it might get harder to remove things like rings or bracelets which is why you should remove them before it gets extreme. After you have first arrested the extent of the damage that could have been caused by the sting, it is time for you to attend to your symptoms. For the pain, you can take an over the counter painkiller. However, ensure that it does not have aspirin for anyone that is under 18 years. To cater to the itchiness, you can take an antihistamine or apply calamine lotion. If not, you can also apply a mixture of baking soda and water. It will take between 2 and 5 days for the area to heal and it is important you keep it clean to avoid infection. However, there are more serious instances where you should call 911. If you start to have trouble breathing, feeling faint or dizzy, your tongue starts to swell or you have a history of severe reactions to insect stings and especially wasps, then you should call for an ambulance as soon as possible. The team created when they wander onto a tray covered using a complicated net which looks like a quilt of cotton candy snares made of fibers that were minuscule intended to trip up the pesky insects. “The fiber’s not sticky, since they don’t like tacky items,” McAllister told Healthline. “Rather, you need gaps in the fiber. With enough differences, as soon as they get one leg caught, they can’t get out.” As the insects struggle to free themselves, others find themselves mired as well and come to their help. The fiber could be added into a bed or carpet sheet, or put around miniature areas for example electrical outlets, which bed bugs use traveling from room to room or apartment to apartment. A professor of engineering and materials science, Miriam Rafailovich, directed the group that employed the technology to live bed bugs in a laboratory, of course you can use common bed bug removal methods in addition or call you local bed bug exterminator Toronto. Shan “Harry” He, a research assistant in the university, helped Rafailovich analyze the non-toxic microfibers. He said Fibertrap was created by them through a procedure known as electrospinning, which uses an electric field produce really thin fibers and to spin a polymer –50 times thinner than a human hair. When the fiber becomes full of bugs, it might be lost, He said, because the material will not damage the environment, will not contain compounds, and is biodegradable. What are the Best Types of High Tech Pest Control Equipment? You can find detailed analysis of pest control equipment, the latest insecticides and safety sheets.